Electric Moon is a German spacerock band, formed in 2009 by guitarist and multi-instrumentalist Sula Bassana (aka Dave Schmidt), who is one of the busiest musicians around, having played with Twilight network, Solaris, Liquid Visions, Zone Six, Weltraumstaunen and Psychedelic Monsterjam (the last with former Guru Guru journeymen Mani Neumeier and Ax Genrich), across krautrock, spacerock and electro musicscapes. "Lunatics" is the 2010 debut for the band, which also includes wonderfully named bassist Komet Lulu and drummer Pablo Carenval (who has since departed at the end of 2010), the former also credited with effects and the latter with samples. Since forming, the band has played alongside the likes of Vibravoid and Ufommaut at various shows and festivals around Germany. "Lunatics" opens with the distorted fuzz bass of "Gefaehrliche Planetengirls" ("Dangerous Planet Girls") that is followed seconds later with crunching effects-heavy guitars, heavy Hammond organ and rhythmic drums, ebbing and flowing through a number of moods in its twelve minute duration. This is one of the only tracks on the album to prominently feature keyboards, which it does to great effect. The (near) title track serves up more of the same spacey grooves, which break down around the seven minute mark for a dreamy echoed section, before the relentless and droning guitars of stage two kicks into gear. "Brain Eaters", the third track in, starts with a sludgy bass riff that leads into a hypnotic stoner rock vibe, keeping to the same few chords, but providing variation through the grooves of the rhythm section and intensity of the guitar. This is not any kind of race to see who can play loudest or fastest; instead, the music drifts through a variety of atmospheres, sometimes potent and rocket-fuelled, sometimes near empty and beatless. On track four, Bassana and friends take a sharp left turn, covering Eric Burdon's "Motel Hell", an ode to the joys of touring, staying in low-rent accommodations a long way from home. The acid-fried keyboards return, flowing beneath doomy yet strangely high pitched vocals to scary effect, nicely breaking up the long psychedelic jam sessions that comprise the rest of the disc. Final track "Moon Love" stretches on for 23 minutes, beginning with funeral procession drums and a space whisper that calls to mind Roger Waters warning Eugene to be careful with that axe. Like that Pink Floyd track, it builds in strength and volume to the point where each band member is pounding away relentlessly by the twelve minute mark, before gradually fading away to more space whispers and eventual blackness. 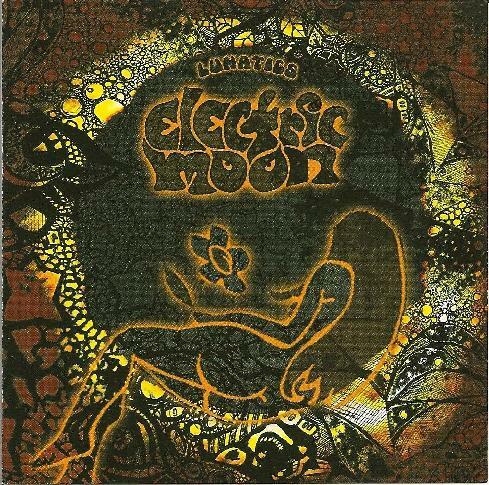 On "Lunatics", Electric Moon are not a band that seem intent on breaking any new ground, but will certainly appeal to fans of late '60's-early '70's space jams patented by the likes of Ash Ra Tempel, Hawkwind, and "Ummagumma"-era Pink Floyd.